Jetsün Kushok Chimey Luding (Tib. རྗེ་བཙུན་འཆི་མེད་ཀླུ་སྡིངས་, Wyl. rje btsun 'chi med klu sdings) (b. 1938) is one of the most respected female teachers of Tibetan Buddhism. Born in 1938, she is the elder sister of the current head of the Sakya lineage, one of the four main schools of Tibetan Buddhism, she received much of her training alongside her brother, His Holiness the Sakya Trizin, from such legendary teachers as Jamyang Khyentse Chökyi Lodrö. Devoting herself to Buddhist practices from an early age, she completed her first retreat at age 10. Many more important retreats like Hevajra, and Vajrayogini were to follow, enabling her to become one of fewer than a dozen masters (and one of the three women in the history of Sakya) who are qualified to transmit the Lamdré or "The Path that Together with its Results." Lamdré, like Dzogchen, Shyijé Chöd and Kalachakra Yogas, is among Tibet's "Eight Chariots," or unique and complete systems of practices leading to enlightenment. Jetsun Kushok gave her first transmission of the Lamdré, along with all the necessary empowerments, at age 17. 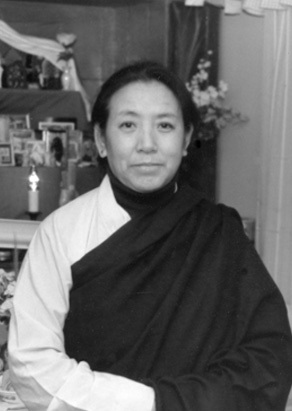 In 1959, Jetsün Kushok left Tibet in exile and, by way of India, eventually settled in Vancouver, Canada with her family in 1971. Struggling to care for her children and make a living in a new country, she had to partition her time between working as a knitwear designer and keeping up her meditation practices, often to the point of staying up all night. At the repeated request of the Sakya Trizin, Jetsün Kushok selflessly started to teach in Vancouver in the early 1980's and now all over the world. Beloved by all her students, Jetsün Kushok is both strict and warm, transmitting only genuine Buddhadharma in the traditional way, seasoned by her pragmatic experience of practicing and working in the West. Having overcome life's twists and turns with diligence and perseverance, Jetsün Kushok is an inspiration for Buddhists, both male and female, who are looking to integrate the Dharma with their daily lives. She is spoken of as an emanation of Vajrayogini. 17-18 October 2008, Lerab Ling, White Tara Wishfulfilling Wheel empowerment and teaching (full title in Wylie, sgrol dkar yid bzhin 'khor lo'i thun mong ma yin pa'i rjes gnang gi cho ga gsal bar bkod pa 'chi med grub pa'i bdud rtsi). On this occasion she also gave the lung for a corresponding sadhana, Chimé Drupé Nyelam and one of its commentaries, as well as Praise to Tara (sgrol ma'i bstod pa); Praise to the Twenty One Taras (sgrol bstod phyag 'tshal nyer gcig); Paying Respect to the Goddess (lha mo la gus ma); The Seven Branches composed by bikshuni Palmo (dge slong ma dpal mos mdzad pa'i yan lag bdun pa). 15 June, teaching on the Twenty-one Taras. This page was last edited on 30 June 2017, at 23:56.